Neither rain, sleet – nor Kassams – can silence wedding bells, but the ceremony was moved from a kibbutz to bear Tel Aviv. Mazal tov. A young couple married in a “flash wedding” near Tel Aviv last week after Hamas rocket fire prevented the marriage at Kibbutz Alumim, whose fields abut the Gaza security fence at northern Gaza. Weddings at Alumim, a strictly agricultural kibbutz, frequently have been punctuated by the sound of rocket fire, but these seldom have interrupted nuptial ceremonies. Last week’s rocket barrage changed the situation. Invitations to more than 650 guests already had been sent for the wedding of Rinat Shickler, of the kibbutz, and her husband, who serves in the IDF. Massive rocket and missile attacks forced them to find a last-minute alternative only several hours before the wedding. The family contacted wedding hall owner Tzion Sasportas in Petach Tikvah, adjacent to Tel Aviv, and he happily told them the hall was not booked. 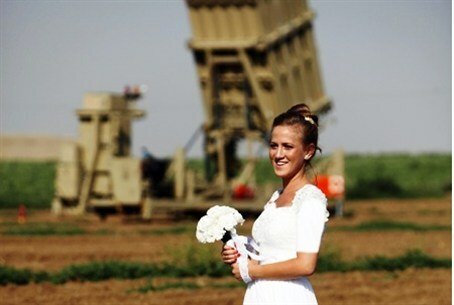 Friends of the newlyweds mobilized and called the caterers and guests to direct them to the new location, but before they were married, Rinat and her fiancé stopped to take some photos in front of the Iron Dome battery, which knocks out almost all of incoming missiles aimed at Be’er Sheva and Ashkelon. The wedding off without a hitch – but without the sounds of Kassam rocket explosions.